Do You Think Working in a Factory is a Good Job or Not? "Is a factory job a good job?" Overall, both city and rural respondents felt that factory work was a good job – this, despite that they knew it was not well-paying. It was a job, and having a job was good. We asked factory workers: What would you do if you did not have this factory job? Among women, the immediate response was always “Ti komes.” (They would buy and sell goods in the street.) So, staying with the factory job was not simply that they had no other options. Several factory workers were proud that they worked in a factory. One claimed to earn the equivalent of $10 US per day, because her team made the quota, got bonuses and overtime. The workers we spoke to had completed at least 9th grade; many had attended university up to some point. They were articulate and interested to meet us. Paulgina is pleased to be included in our interviews. She is 28 and tells us that she works for a Korean-owned textile factory. 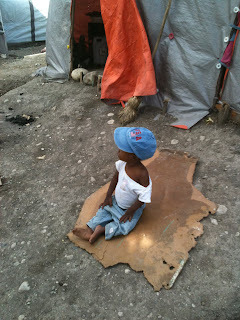 She is happy to sit and talk to us, in front of her extended tent and tarp residence in the center of Port au Prince. Tall, heavy set – should I say “large?”- she is laughing and well-groomed. She got the factory job through a friend. Just the way things often happen here in the States, says I to me. She had started high school, but had to quit. This was some years ago. She is happy to be working, no matter the pay. Says I to me, somehow, people seem to manage. No complaints so far, says I to me. Paulgina says she starts at 6:30 a.m., has a break at 11:00 to 11:30, then continues until 5 p.m. I ask her about the one hour lunch, which I understood was the law. Shrugging – now, I know what is coming – she tells me: “Sa depan." She likes her job. She appreciates have a salary. She is able to make things better for her relatives who share this tent, and the next one over. I begin to understand: It is pretty special to have a job – what we might consider a low level job – in a country with an unemployment rate pegged at, what, about 60%? Of course, whoever is doing that counting is not counting all the work going on around us as we sit, even here in Delmas 6 tents and tin boxes. Everyone is working, hustling at least. Kids are crowding around us, mainly around me that is – and it is almost time for one the the World Cup games to start. It’s Argentina today and the tent camp is divided into two, er, camps: some are for Argentina and some folks are for Brazil, the traditional Haitian favorite. It seems to me that more elite, more working class, more city folks, are siding with the Argentines, but this isn’t clear. Paulgina invites us to watch at the TV of her cousin, in an adjacent tent and tarp structure. I am a soccer fanatic – it is the only sport I understand – and I am eager to get inside as many tents as I can squeeze into – so I tell her I will join them She tells Shirley, another cousin, to fetch stool for me. Now, the tent we enter is huge, tall ceilings and cement blocks laid out on part of the floor. There is even a refrigerator at one end. Of course, a TV, a big screen and it is in color. Of course, remittance monies are rounding out any “earned income” that heads of households in this tent are bringing in. To us, it may seem like camping, but for folks here it is just the way it is – maybe even a little better in some ways – than they had been living before the EQ. Here, they are getting water brought in by an NGO. 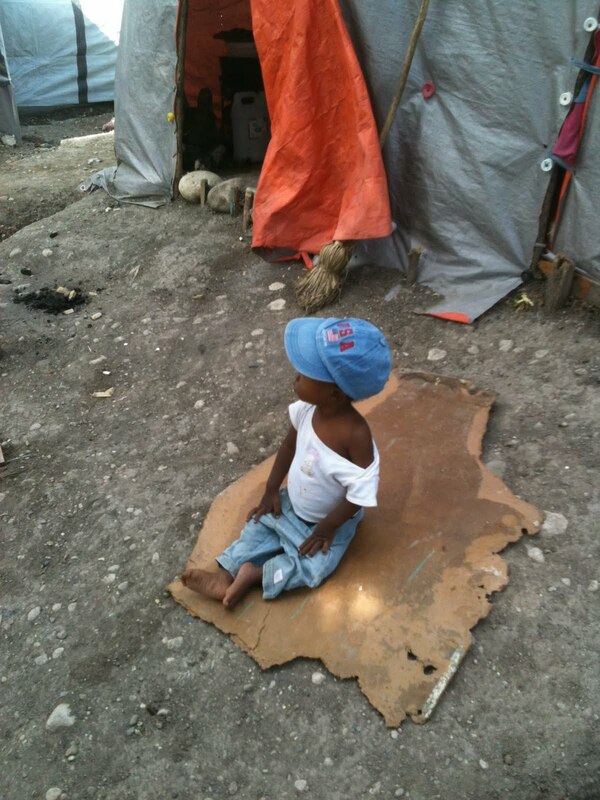 Here, there are some sort of latrines – even if they have no doors and are filthy. 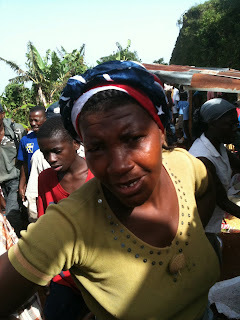 For some of Haiti’s underemployed, Delmas 6 is a step up. Paulgina’s cousin’s family are thrilled to have me; some speak a bit of English. I ask one husky young man where he’d learned – I am really impressed as he speaks well and I can understand him easily. He tells me he learned English on the street, that’s all. That and TV. Later on, I see Shirley sweeping, tidying up Paulgina’s tent and washing dishes. Shirley fetches a bokit of water now that Project Concern’s truck has arrived and the tap is turned on. Shirley and her 3 year old, Woud, line up and wait. Paulgina will give Shirley maybe 5 or 10 goudes for this help today. If Shirley gets four or five little jobs like this, she can buy a plate of spaghetti (no meat) for herself and Woud. Or, somebody might share some cooked food with them. It strikes me: This crowded maze of invested sluices, trash and families is full of oh-so-patient 3 year olds. There he is, little Woud, behind his mother, not complaining, not whining. Just…there.